Accidents happen, but the right furniture can prevent an accident from becoming a big mess. Incontinence is an issue for health care facilities such as senior living homes. Limited mobility and incontinence sofas and chairs can help health care practitioners make cleanup an easier process while encouraging independence for senior patients. 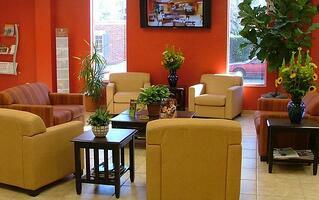 Here’s how quality incontinence furniture can benefit your facility. Bad stains are no good for your furniture. That’s why limited mobility and incontinence sofas and chairs are designed to resist urine and other fluids so that you can easily clean up accidents without having to worry about a messy cleanup and stained furniture. Incontinence seating is made with fluid- and stain-resistant fabrics and vinyls to keep urine and other substances from absorbing into your furniture. Pop out seats also allow fluids to fall to the floor so that you can easily mop up the mess. Incontinence sofas and chairs can also feature anti-microbial, anti-fungal, and stain repellant fabric treatments for even more protection. Stiff, uncomfortable seating isn’t going to encourage socialization. Common area seating is a great way to allow residents to gather together, but mobility issues can scare people away from these gatherings, especially if they’re concerned about their incontinence. However, furniture designed for people with limited mobility can promote independence among residents and other people by making it easier to get in and out of their seat. Limited mobility seating is designed for comfort, ease of use, and safety. Modifications including cushion firmness and seat height can make a huge difference for anyone with limited mobility, especially those concerned about having to quickly leave if the need to use the restroom arises. With limited mobility seating, they can get up and go without being worried about getting stuck in an embarrassing situation. Incontinence issues can be a major problem for both health care and group living facilities. Furniture Concepts provides contact group living furniture that can benefit people with incontinence and mobility issues. 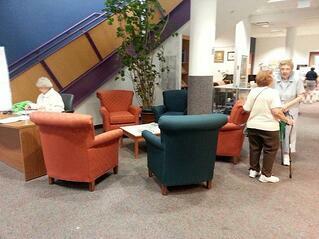 Create a custom Furniture Concepts Wish List today to get a quote on incontinence seating for your facility.